The EU Framework Programme (FP) is by far the most important European intervention for research and technological development (RTD). While this policy has been repeatedly reformed, the FP has also shaped European research since 1984. The largest part of the FP aims to promote transnational RTD projects granting funds for ‘excellent research’ (the so-called ‘FP-Cooperation’, which covers about two thirds of the whole budget), irrespective of their geographical localisation. However, as our study on the geographical distribution of FP participation shows, ‘excellent’ research is also unevenly spread across Europe. Why is important to study the geographical distribution of FP participations? There are two major reasons. First, in the political debate there are claims for an equal distribution of funds across member states, implicitly claiming for a correction on the criteria of ‘scientific excellence’ that is considered to be biased in favour of most advanced countries. Second, in the scientific literature, research has been largely recognised as a fundamental input for ‘regional systems of innovation’ (RSI) (Cooke et al., 1997; Iammarino, 2005; Moulaert and Sekia, 2003). Since 1990s, RSIs were identified as good practices for a transition through a ‘knowledge-based economy’ based on synergies among universities, firms and governments (Etzkowitz and Leydesdorff, 2000). In this perspective, the understanding of where ‘excellent research’ is carried out contributes to identify the ‘research competitiveness’ of European territories, and then how this support regional innovation capacities. Research is cumulative: once a district was able to carry out ‘excellent research’, they are more likely to keep this dominant position. Research is a process based on cumulative experiences, and it takes time for newcomers to reach the level of already advanced experts in a certain specialised field. The FP has a competitive rationale based on open calls for funding. This implies that a ‘leading position’ cannot be taken for granted and newcomers have space to increase their rate of FP participation. The competitive nature of FP calls for projects makes possible significant changes in the rate of FP participation over time. Where is ‘excellent research’ carried out? If FP projects are selected only for their ‘scientific excellence’, the distribution of FP participants can be assumed as indicator for where excellent research is. For this purpose, the EU Commission’s database named CORDIS was largely used by scholars to analyse participations providing a large literature on how scientific communities are structured around Europe (Autant-Bernard and Chalaye, 2013; Autant-Bernard et al., 2007; Barber and Scherngell, 2013; Barber et al., 2011; Heller-Schuh et al., 2011; Wanzenböck et al., forthcoming). These analyses were very useful to understand partnerships’ networks that show the progressive integration of national research communities towards a ‘European Research Area’, however, little is said on the geographical dimensions and long-term evolutions due to significant limitations in available data. An innovative database, developed in the context of the ‘Geography of Research in Europe And Territorial Policy Innovations’ GREATPI project, allows for a very detailed analysis. First, each FP participant has been associated with its geographical district (NUTS3), providing a better focus in comparison to previous analyses that considered just the regional level (NUTS2). Second, a long process of data cleaning allows long-term analysis during last decade from FP5 (1999-2002) to FP7 (2007-2010[i]). For the purpose of our analysis, we have selected three FP-Cooperation’s themes: biotechnologies (KBBE), energy and environment. These FP themes represent about one fifth of the whole FP-Cooperation and were selected because they represent some of the societal challenges and are fully comparable across FP periods, while other themes changed. In the field of geography, the ‘core-periphery’ theory is well known: high-quality functions (in this case the ‘excellent research activities’) tend to be concentrated in the core leaving the periphery with only secondary functions. This concentration was already identified by several authors also in the case of FP participation (Autant-Bernard and Chalaye, 2013; Barber and Scherngell, 2013; Barber et al., 2011; Heller-Schuh et al., 2011), however, what was missing was the dynamic perspective of how this ‘core’ evolves. To test the hypothesis of an ‘open polycentrism’, we extracted the top-5 percentile of districts in terms of FP participations from FP5 (1999-2002) to FP7 (2007-2010) in the three selected themes (Biotechnologies – KBBE, Environment and Energy), and plotted them as shown in Figure 1. By this simple comparison, it is possible to understand how the performance of top-performing districts changed over time. Before entering into the discussion, a general observation is necessary: the sample includes the entire EU as well as Associated Countries, such as Turkey, Switzerland and Norway among others, that participate in the FP with the same funding and rights as EU member states. Furthermore, the selected period corresponds with the full integration of new member states, which were already fully involved in the FP policy since 1999. In Figure 1, there are three major findings. First, there are several observations with always high and stable rates of FP participation (the ‘core’). This is the effect of the cumulative nature of research because those that were the most advanced research centres are more likely to keep on being on the frontier of research, also thanks to FP providing extra funding to further advance. Second, in this core there are multiple districts with comparable performance and just one (Paris, on the top-right), which is decreasing its leading position. Third, looking to districts with lower performances there is a significant dynamism with many observations far from the diagonal, implying that their performances significantly changed from FP5 to FP7. 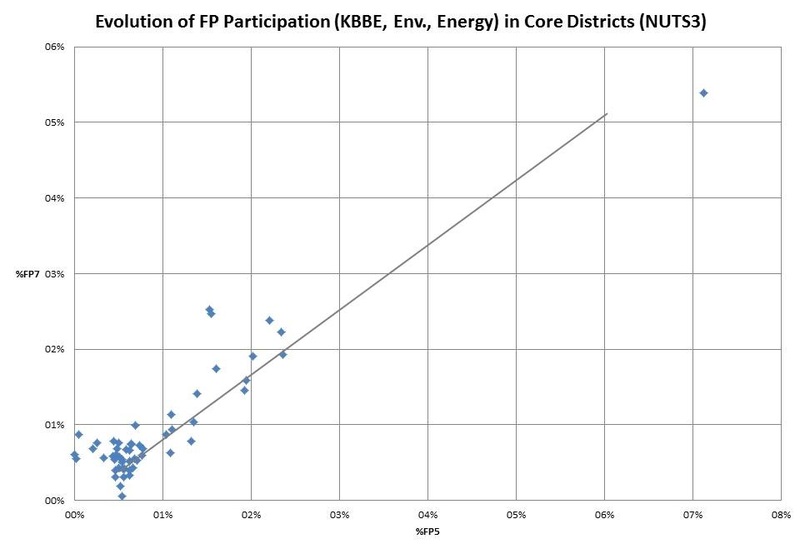 This is the case for both districts able to increase their rate of FP participations and for those reducing it; nonetheless, it should be noticed that observations joining the ‘core’ does not come from zero participation, and this further confirms the cumulative nature of research. On the other hand, this dynamism is determined by the open competition of FP calls. How is this possible? There are two main reasons to explain this ‘open polycentrism’. First, Europe is a large space with several ‘centres’ and the open calls for FP funding allow all the research centres to participate and compete for those funds. Second, the FP is just one of the RTD policies active in Europe: member states have their own national and regional policies to support their own research centres. This support implicitly affects the rate of FP participations because member states can develop internally their own research centres, and then improve their ‘European competitiveness’ in FP calls. What are the lessons that can be derived from this exercise for the EU Horizon 2020 programme? First, the FP is really a competitive mechanism. The criteria for ‘scientific excellence’ is really open and offer opportunity for newcomers to increase their rate of participation without any guarantees for those who won in previous calls. The claim that funds go always to the same research centre is, in fact, false or, more precisely, there is space for newcomers to increase their rate of FP participation. It should be highlighted, moreover, that the FP-Cooperation programme does not aim to increase the research capacities, but only to fund ‘excellent research’. While the EU has had only minor programmes to support research capacities, member states are the main actors responsible for these investments. Second, ‘excellent research’ is not for everybody, but this does not mean that second-level districts should give up their RTD investments. If the FP participation is an indicator of research competitiveness, this shows space for those investing in RTD to reach the level of ‘European excellence’, although it should be recognised that FP is not the only programme funding ‘excellence’ and other sources are available. This should be seen as good opportunities because it provides a return for districts investing in their research competitiveness that can be measured in terms of FP participation. Third, an open issue exist regarding synergies with Structural Funds (SF), which are often used to promote RTD investments. The EU regional policy aims to support lagging regions promoting territorial convergence; however, not any region benefiting from SF is in the FP (an open polycentric) core. While this can be seen as a contradiction, it comes with no surprise. If the FP aims to support ‘scientific excellence’ at the European level, lagging regions are expected to have a long-way before joining the frontier of research; otherwise, they would not be ‘lagging’ and would appear as part of the core at certain periods of time. Bearing in mind that the FP is only about 7.5% of the public funds spent in Europe for RTD, there are other possibilities to increase research competitiveness of regions/districts, but these would rely on the member states. This analysis identified the forces explaining the spatial distribution of FP participations. Findings show how competitive and dynamic the European research geography is in terms of FP participations; however, this mechanism is open for those already having RTD capacities that are able to reach the top performing core starting from mid-level performances. Indeed, there is an open issue regarding territories without ‘excellent’ RTD actors. The availability of a new and geographically detailed database will allow for further and more specific analysis of the European research geography. Dr. Nicola Francesco Dotti is post-doc in economic geography at Cosmopolis, centre for urban research of the Vrije Universiteit Brussel (VUB). Prof.Dr.Bas Van Heur is an assistant professor in social geography and director of Cosmopolis (VUB). Dr. André Spithoven works at the Belgian Science Policy Office (BELSPO) and the Universiteit Gent (UGent). This blog post is based on an ongoing research which will be presented at the ERA CRN workshop ‘Governance of the Europe of Knowledge’ Cambridge University, 10-11 April 2014. Autant-Bernard, C and Chalaye, S, 2013, “Knowledge diffusion between European Neighboring Countries and the European Union”, http://www.ub.edu/searchproject/wp-content/uploads/2013/01/WP-4.13.pdf. Autant-Bernard, C, Mairesse, J, and Massard, N, 2007, “Spatial knowledge diffusion through collaborative networks*” Papers in Regional Science 86(3) 341–350. Barber, M J, Fischer, M M, and Scherngell, T, 2011, “The Community Structure of Research and Development Cooperation in Europe: Evidence from a Social Network Perspective” Geographical Analysis 43(4) 415–432. Barber, M J and Scherngell, T, 2013, “Is the European R&D Network Homogeneous? Distinguishing Relevant Network Communities Using Graph Theoretic and Spatial Interaction Modelling Approaches” Regional Studies 47(8) 1283–1298. Cooke, P, Gomez Uranga, M, and Etxebarria, G, 1997, “Regional innovation systems: Institutional and organisational dimensions” Research Policy 26(4-5) 475–491. Etzkowitz, H and Leydesdorff, L, 2000, “The dynamics of innovation: from National Systems and ‘mode 2’ to a Triple Helix of university-industry-government relations” Research Policy 29(2) 109–123. Heller-Schuh, B, Barber, M, Henriques, L, Paier, M, Pontikakis, D, Scherngell, T, Veltri, G A, and Weber, M, 2011, “Analysis of Networks in European Framework Programmes (1984-2006)”, JRC-IPTS, Sevilla, http://erawatch.jrc.ec.europa.eu/erawatch/export/sites/default/galleries/generic_files/file_0161.pdf. Iammarino, S, 2005, “An evolutionary Integrated View of Regional Systems of innovation: concepts, measures and historical perspectives” European Planning Studies 13(4) 497–519. Moulaert, F and Sekia, F, 2003, “Territorial Innovation Models: A Critical Survey” Regional Studies 37(3) 289–302. Wanzenböck, I, Scherngell, T, and Lata, R, forthcoming, “Embeddedness of European Regions in European Union-Funded Research and Development (R&D) Networks: A Spatial Econometric Perspective” Regional Studies 0(0) 1–21. [i] FP7 ended in 2013, but unfortunately data for the period 2011-13 are not yet available. Dr. Nicola Francesco Dotti is post-doc in economic geography at Cosmopolis, centre for urban research of the Vrije Universiteit Brussel (VUB). Prof.Dr.Bas Van Heur is an assistant professor in social geography and director of Cosmopolis (VUB). Dr. André Spithoven works at the Belgian Science Policy Office (BELSPO) and the Universiteit Gent (UGent). This entry was posted in Economics & Trade, Politics & Public Policy, Science & Technology, The EU and tagged European Research Area, Framework Programme, Horizon 2020, regional development, regional innovation systems, Research funding, research policy. Bookmark the permalink.